Fobos-Grunt or Phobos-Grunt (Russian: Фобос-Грунт, literally "Phobos-Ground") was an attempted Russian sample return mission to Phobos, one of the moons of Mars. Fobos-Grunt also carried the Chinese Mars orbiter Yinghuo-1 and the tiny Living Interplanetary Flight Experiment funded by the Planetary Society. It was launched on 9 November 2011 at 02:16 local time (8 November 2011, 20:16 UTC) from the Baikonur Cosmodrome, but subsequent rocket burns intended to set the craft on a course for Mars failed, leaving it stranded in low Earth orbit. Efforts to reactivate the craft were unsuccessful, and it fell back to Earth in an uncontrolled re-entry on 15 January 2012, over the Pacific Ocean west of Chile. The return vehicle was to have returned to Earth in August 2014, carrying up to 200 g of soil from Phobos. The cost of the project was 1.5 billion rubles (64.4 million USD). Project funding for the timeframe 2009–2012, including post-launch operations, was about 2.4 billion rubles. The total cost of the mission was to have been 5 billion rubles (163 million USD). According to lead scientist Alexander Zakharov, the entire spacecraft and most of the instruments were new, though the designs drew upon the nation's legacy of three successful Luna missions, which in the 1970s retrieved a few hundred grams of Moon rocks. Zakharov had described the Phobos sample return project as "possibly the most difficult interplanetary one to date." 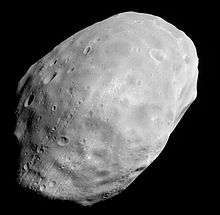 Image of Phobos. The Fobos-Grunt project began with the feasibility study of a Phobos sample-return mission in 1999. The Fobos-Grunt project began in 1999, when the Russian Space Research Institute and NPO Lavochkin, the main developer of Soviet and Russian interplanetary probes, initiated a 9 million rouble feasibility study into a Phobos sample-return mission. The initial spacecraft design was to be similar to the probes of the Fobos program launched in the late 1980s. Development of the spacecraft started in 2001 and the preliminary design was completed in 2004. For years, the project stalled as a result of low levels of financing of the Russian space program. This changed in the summer of 2005, when the new government plan for space activities in 2006–2015 was published. Fobos-Grunt was now made one of the program's flagship missions. With substantially improved funding, the launch date was set for October 2009. The 2004 design was revised a couple of times and international partners were invited to join the project. In June 2006, NPO Lavochkin announced that it had begun manufacturing and testing the development version of the spacecraft's onboard equipment. On 26 March 2007, Russia and China signed a cooperative agreement on the joint exploration of Mars, which included sending China's first interplanetary probe, Yinghuo-1, to Mars together with the Fobos-Grunt spacecraft. Yinghuo-1 weighed 115 kg (250 pounds) and would have been released by the main spacecraft into a Mars orbit. The Chinese Yinghuo-1 orbiter was launched together with Fobos-Grunt. In late 2012, after a 10–11.5-month cruise, Yinghuo-1 would have separated and entered an 800×80,000 km equatorial orbit (5° inclination) with a period of three days. The spacecraft was expected to remain on Martian orbit for one year. Yinghuo-1 would have focused mainly on the study of the external environment of Mars. Space center researchers expected to use photographs and data to study the magnetic field of Mars and the interaction between ionospheres, escape particles and solar wind. A second Chinese payload, the Soil Offloading and Preparation System (SOPSYS), was integrated in the lander. SOPSYS was a microgravity grinding tool developed by the Hong Kong Polytechnic University. Another payload on Fobos-Grunt was an experiment from the Planetary Society called Living Interplanetary Flight Experiment; its goal was to test whether selected organisms can survive a few years in deep space by flying them through interplanetary space. The experiment would have tested one aspect of transpermia, the hypothesis that life could survive space travel, if protected inside rocks blasted by impact off one planet to land on another. The Bulgarian Academy of Sciences contributed with a radiation measurement experiment on Fobos-Grunt. Two MetNet Mars landers developed by the Finnish Meteorological Institute, were planned to be included as payload of the Fobos-Grunt mission, but weight constraints on the spacecraft required dropping the MetNet landers from the mission. The October 2009 launch date could not be achieved due to delays in the spacecraft development. During 2009, officials admitted that the schedule was very tight, but still hoped until the last moment that a launch could be made. On 21 September 2009 the mission was officially announced to be delayed until the next launch window in 2011. A main reason for the delay was difficulties encountered during development of the spacecraft's onboard computers. While the Moscow-based company Tehkhom provided the computer hardware on time, the internal NPO Lavochkin team responsible for integration and software development fell behind schedule. The retirement of NPO Lavochkin's head Valeriy N. Poletskiy in January 2010 was widely seen as linked to the delay of Fobos-Grunt. Viktor Khartov was appointed the new head of the company. During the extra development time resulting from the delay, a Polish-built drill was added to the Phobos lander as a back-up soil extraction device. The spacecraft arrived at Baikonur on 17 October 2011 and was transported to Site 31 for pre-launch processing. The Zenit-2SB41 rocket carrying Fobos-Grunt successfully lifted off from Baikonur Cosmodrome at 20:16 UTC on 8 November 2011. The Zenit booster inserted the spacecraft into an initial 207 km × 347 km (129 mi × 216 mi) elliptical low Earth orbit with an inclination of 51.4 degrees. Two firings of the main propulsion unit in Earth orbit were required to send the spacecraft onto the interplanetary trajectory. Since both engine ignitions would have taken place outside the range of Russian ground stations, the project participants asked volunteers around the world to take optical observations of the burns, e.g. with telescopes, and report the results to enable more accurate prediction of the mission flight path upon entry into the range of Russian ground stations. It was expected that after 2.5 hours and 1.7 revolutions in the initial orbit, the autonomous main propulsion unit (MDU), derived from the Fregat upper stage, would conduct its firing to insert the spacecraft into the elliptical orbit (250 km x 4,150–4,170 km) with a period of about 2.2 hours. After the completion of the first burn, the external fuel tank of the propulsion unit was expected to be jettisoned, with ignition for a second burn to depart Earth orbit scheduled for one orbit, or 2.1 hours, after the end of the first burn. The propulsion module constitutes the cruise-stage bus of Fobos-Grunt. According to original plans, Mars orbit arrival had been expected during September 2012 and the return vehicle was scheduled to reach Earth in August 2014. Following what would have been the planned end of the first burn, the spacecraft could not be located in the target orbit. The spacecraft was subsequently discovered to still be in its initial parking orbit and it was determined that the burn had not taken place. Initially, engineers had about three days from launch to rescue the spacecraft before its batteries ran out. It was then established that the craft's solar panels had deployed, giving engineers more time to restore control. It was soon discovered the spacecraft was adjusting its orbit, changing its expected re-entry from late November or December to as late as early 2012. Even though it had not been contacted, the spacecraft seemed to be actively adjusting its perigee (the point it is closest to Earth in its orbit). On 22 November 2011, a signal from the probe was picked up by the European Space Agency's tracking station in Perth, Australia, after it had sent the probe the command to turn on one of its transmitters. The European Space Operations Centre (ESOC) in Darmstadt reported that the contact was made at 20:25 UTC on 22 November 2011 after some modifications had been made to the 15 m dish facility in Perth to improve its chances of getting a signal. No telemetry was received in this communication. It remained unclear whether the communications link would have been sufficient to command the spacecraft to switch on its engines to take it on its intended trajectory toward Mars. Roscosmos officials said that the window of opportunity to salvage Fobos-Grunt would close in early December. The next day, on 23 November, the Perth station again made contact with the spacecraft and during 6 minutes, about 400 telemetry "frames" and Doppler information were received. The amount of information received during this communication was not sufficient, and therefore it was not possible to identify the problem with the probe. Further communication attempts made by ESA were unsuccessful and contact was not reestablished. The space vehicle did not respond to the commands sent by the European Space Agency to raise its orbit. Roscosmos provided these commands to ESA. From Baikonour, Kazakhstan, Roscosmos was able to receive telemetry from Fobos-Grunt on 24 November but attempts to contact it failed. This telemetry demonstrated that the probe's radio equipment was working and that it was communicating with the spacecraft's flight control systems. Moreover, Roscosmos's top officials believed Fobos-Grunt to be functional, stably oriented and charging batteries through its solar panels. In a late November 2011 interview, the service manager of the European Space Agency for Fobos-Grunt, Wolfgang Hell, stated that Roscosmos had a better understanding of the problem with the spacecraft, saying they reached the conclusion that they have some kind of power problem on board. ESA failed to communicate with the space probe in all of the five opportunities the agency had between 28 and 29 November. During those occasions the spacecraft did not comply with orders to fire the engines and raise its orbit. The Russian space agency then requested that ESA repeat the orders. The European Space Agency decided to end the efforts to contact the probe on 2 December 2011, with one analyst saying Fobos-Grunt appeared "dead in the water". However, ESA made teams available to assist the Fobos-Grunt mission if there was a change in situation. In spite of that Roscosmos stated their intention to continue to try to contact the space vehicle until it entered the atmosphere. The US Strategic Command’s Joint Space Operations Center (JSpOC) tracked the probe and identified at the start of December that Fobos-Grunt had an elliptical orbit at an altitude of between 209 kilometres (130 mi) and 305 kilometres (190 mi), but falling a few miles each day. Before reentry, the spacecraft still carried about 7.51 metric tonnes of highly toxic hydrazine and nitrogen tetroxide on board. This was mostly fuel for the spacecraft's upper stage. These compounds, with melting points of 2 °C and −11.2 °C, are normally kept in liquid form and were expected to burn out during re-entry. NASA veteran James Oberg said the hydrazine and nitrogen tetroxide "could freeze before ultimately entering", thus contaminating the impact area. He also stated that if Fobos-Grunt is not salvaged, it may be the most dangerous object to fall from orbit. Meanwhile, the head of Roscomos said the probability of parts reaching the Earth surface was "highly unlikely", and that the spacecraft, including the LIFE module and the Yinghuo-1 orbiter, would be destroyed during re-entry. Russian military sources claimed that Fobos-Grunt was somewhere over the Pacific Ocean between New Zealand and South America when it re-entered the atmosphere at about 17:45 UTC. Although it was initially feared its remains would reach land as close as 145 km west of Santa Fe, Argentina, the Russian military Air and Space Defense Forces reported that it ultimately fell into the Pacific Ocean, 775 miles (1,247 km) west of Wellington Island, Chile. The Defence Ministry spokesman subsequently revealed that such estimate was based on calculations, without witness reports. In contrast, Russian civilian ballistic experts said that the fragments had fallen over a broader patch of Earth's surface, and that the midpoint of the crash zone was located in the Goiás state of Brazil. Initially, the head of Roscosmos Vladimir Popovkin, suggested that the Fobos-Grunt failure might have been the result of sabotage by a foreign nation. He also stated that risky technical decisions had been made because of limited funding. On 17 January 2012, an unidentified Russian official speculated that a U.S. radar stationed on the Marshall Islands may have inadvertently disabled the probe, but cited no evidence. Popovkin suggested the microchips may have been counterfeit, then he announced on 1 February that a burst of cosmic radiation may have caused computers to reboot and go into a standby mode. Industry experts cast doubt on the claim citing how unlikely the effects of such a burst are in low Earth orbit, inside the protection of Earth's magnetic field. On 6 February 2012, the commission investigating the mishap concluded that Fobos-Grunt mission failed because of "a programming error which led to a simultaneous reboot of two working channels of an onboard computer." The craft's rocket pack never fired due to the computer reboot, leaving the craft stranded in Earth orbit. Although the specific failure was identified, experts suggest it was the culmination of poor quality control, lack of testing, and corruption. Russian president Dmitry Medvedev suggested that those responsible should be punished and perhaps criminally prosecuted. In January 2012, scientists and engineers at the Russian Space Research Institute and NPO Lavochkin called for a repeat sample return mission called Fobos-Grunt-2 and Boomerang for launch in 2020. Popovkin declared that they would soon attempt to repeat the Fobos-Grunt mission, if an agreement was not reached for Russian co-operation in the European Space Agency's ExoMars program. However, since an agreement was reached for the inclusion of Russia as a full project partner, some instruments originally developed for Fobos-Grunt will be flown in ExoMars Trace Gas Orbiter. On 2 August 2014 the Russian Academy of Sciences stated that the Phobos-Grunt repeat mission might be restarted for a launch approximately in 2024. In August 2015, the ESA-Roscosmos working group on post-ExoMars cooperation, completed a joint study for a possible future Phobos sample return mission, preliminary discussions were held, and in May 2015 the Russian Academy of Sciences submitted a budget proposal. Roscosmos is also currently studying a proposal for an international Mars sample return mission called Mars-Grunt, to take place by 2026. This Mars sample-return mission would be developed from the technologies demonstrated by Fobos-Grunt 2. Fobos-Grunt was an intended interplanetary probe that included a lander to study Phobos and a sample return vehicle to return a sample of about 200 g (7.1 oz) of soil to Earth. It was also to study Mars from orbit, including its atmosphere and dust storms, plasma and radiation. Study of the impact of a three-year interplanetary round-trip journey on extremophile microorganisms in a small sealed capsule (LIFE experiment). The spacecraft's journey to Mars would take about ten months. After arriving in Mars orbit, the main propulsion unit and the transfer truss would separate and the Chinese Mars orbiter would be released. Fobos-Grunt would then spend several months studying the planet and its moons from orbit, before landing on Phobos. It was imperative to prevent the introduction to Mars of contaminants from Earth; according to Fobos-Grunt Chief Designer Maksim Martynov, the probability of the probe accidentally reaching the surface of Mars was much lower than the maximum specified for Category III missions, the type assigned to Fobos-Grunt and defined in COSPAR's planetary protection policy (in accordance with Article IX of the Outer Space Treaty). The planned landing site at Phobos was a region from 5°S to 5°N, 230° to 235°E. Soil sample collection would begin immediately after the lander touched down on Phobos, with collection lasting 2–7 days. An emergency mode existed for the case of communications breakdown, which enabled the lander to automatically launch the return rocket to deliver the samples to Earth. A robotic arm would have collected samples up to 0.5 inches (1.3 cm) in diameter. At the end of the arm was a pipe-shaped tool which split to form a claw. The tool contained a piston which would have pushed the sample into a cylindrical container. A light-sensitive photo-diode would have confirmed whether material collection was successful and also allowed visual inspection of the digging area. The sample extraction device would have performed 15 to 20 scoops yielding a total of 3 to 5.5 ounces (85 to 156 g) of soil. The samples would be loaded into a capsule which would then be moved inside a special pipeline into the descent module by inflating an elastic bag within the pipe with gas. Because the characteristics of Phobos soil are uncertain, the lander included another soil-extraction device, a Polish-built drill, which would have been used in case the soil turned out to be too rocky for the main scooping device. After the departure of the return stage, the lander's experiments would have continued in situ on Phobos' surface for a year. To conserve power, mission control would have turned these on and off in a precise sequence. The robotic arm would have placed more samples in a chamber that would heat it and analyze its emission spectra. This analysis might have been able to determine the presence of volatile compounds, such as water. The return stage was mounted on top of the lander. It would have needed to accelerate to 35 km/h (22 mph) to escape Phobos' gravity. In order to avoid harming the experiments remaining at the lander, the return stage would have ignited its engine once the vehicle had been vaulted to a safe height by springs. It would then have begun maneuvers for the eventual trip to Earth, where it would have arrived in August 2014. An 11-kg descent vehicle containing the capsule with soil samples (up to 0.2 kg (0.44 lb)) would have been released on direct approach to Earth at 12 km/s (7.5 mi/s). Following the aerodynamic braking to 30 m/s (98 ft/s) the conical-shaped descent vehicle would perform a hard landing without a parachute within the Sary Shagan test range in Kazakhstan. The vehicle did not have any radio equipment. Ground-based radar and optical observations would have been used to track the vehicle's return. Mars arrival 25 August – 26 September 2012 945 m/s braking burn to enter initial Mars parting orbit with periapsis= 800 ± 400 km, apoapsis=79,000 km and period of three days. Propulsion module and Yinghuo-1 separates from the rest of the craft. Transfer to intermediate Mars orbit October - December 2012 220 m/s engine burn to raise periapsis to 6499 km, changing the orbital period to 3.3 days and the orbital inclination to that of Phobos. Transfer to Phobos observation orbit December 2012 705 m/s engine burn to insert the craft into an early circular orbit with an average radius of 9910 km, i.e. about 535 km above Phobos orbit, and orbital period =8.3 h.
Rendezvous with Phobos January 2013 45 m/s + 20 m/s engine burns for transfer to quasi-synchronous orbit where the probe always remains within 50..140 km of Phobos. Phobos landing and surface activities End of January - beginning of April 2013 Landing maneuver takes two hours (100 m/s delta V trajectory changes). Separation of Earth return vehicle (ERV) from lander April 2013 10 m/s + 20 m/s trajectory change to enter parking orbit 300–350 km lower than Phobos with a period of 7.23 hours. 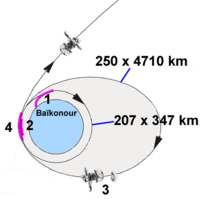 ERV transfer orbit Starting in August 2013 740 m/s periapsis burn for insertion into 3-day elliptical transfer orbit. ERV pre orbit insertion Mid-August 2013 125 m/s burn to change the inclination of the orbit while decreasing the periapsis distance to 500–1000 km above the martian surface. ERV trans-Earth injection burn 3–23 September 2013 Final 790 m/s engine burn to accelerate out of Mars orbit. ERV Earth arrival 15–18 August 2014 Up to five trajectory corrections (combined delta V < 130 m/s) would be performed before atmospheric entry. The mission control center was located at the Center for Deep Space Communications (Национальный центр управления и испытаний космических средств (Russian), Євпаторійський центр дальнього космічного зв'язку (Ukrainian)) equipped with RT-70 radio telescope near Yevpatoria in Crimea, Ukraine. Russia and Ukraine agreed in late October 2010 that the European Space Operations Centre in Darmstadt, Germany, would have controlled the probe. Communications with the spacecraft on the initial parking orbit are described in a two-volume publication. Barry E. DiGregorio, Director of the International Committee Against Mars Sample Return (ICAMSR), criticised the LIFE experiment carried by Fobos-Grunt as a violation of the Outer Space Treaty due to the possibility of contamination of Phobos or Mars with the microbial spores and live bacteria it contains should it have lost control and crash-landed on either body. It is speculated that the heat-resistant extremophile bacteria could survive such a crash, on the basis that Microbispora bacteria survived the Space Shuttle Columbia disaster. According to Fobos-Grunt Chief Designer Maksim Martynov, the probability of the probe accidentally reaching the surface of Mars was much lower than the maximum specified for Category III missions, the type assigned to Fobos-Grunt and defined in COSPAR's planetary protection policy (in accordance with Article IX of the Outer Space Treaty). ↑ Jonathan Amos (9 November 2011). "Phobos-Grunt Mars probe loses its way just after launch". BBC. 1 2 Molczan, Ted (9 November 2011). "Phobos-Grunt – serious problem reported". SeeSat-L. Retrieved 9 November 2011. 1 2 "Russian space probe crashes into Pacific Ocean". Fox News Channel. 15 January 2012. ↑ "Jonathan's Space Report No. 650 2011 Nov 16". 1 2 3 "Daring Russian Sample Return mission to Martian Moon Phobos aims for November Liftoff". Universe Today. 13 October 2011. ↑ "NASA Spacecraft Returns With Comet Samples After 2.9 Bln Miles". Bloomberg. 15 January 2006. Retrieved 4 March 2008. 1 2 3 Zaitsev, Yury (14 July 2008). "Russia to study Martian moons once again". RIA Novosti. 1 2 3 Zak, Anatoly. "Preparing for flight". Russianspaceweb.com. Retrieved 26 May 2009. ↑ "Russia takes aim at Phobos". Nature. 4 November 2011. 1 2 "Mars Moon Lander to Return Russia to Deep Space". The Moscow Times. 8 November 2011. 1 2 Harvey, Brian (2007). "Resurgent – the new projects". The Rebirth of the Russian Space Program (1st ed.). Germany: Springer. pp. 326–330. ISBN 978-0-387-71354-0. ↑ "Russia to test unmanned lander for Mars moon mission". RIA Novosti. 9 September 2010. ↑ "China to launch probe to Mars with Russian help in 2009". RIA Novosti. 5 December 2008. 1 2 3 "Phobos-Grunt". European Space Agency. 25 October 2004. Retrieved 26 May 2009. ↑ Bergin, Chris (21 May 2007). "With a Russian hitch-hike, China heading to Mars". NASAspaceflight. ↑ "China and Russia join hands to explore Mars". People's Daily. 30 May 2007. Retrieved 31 May 2007. ↑ Zhao, Huanxin (27 March 2007). "Chinese satellite to orbit Mars in 2009". China Daily. ↑ "HK triumphs with out of this world invention". HK Trader. 1 May 2007. ↑ "Projects: LIFE Experiment: Phobos". The Planetary Society. Retrieved 2 April 2011. ↑ Zak, Anatoly (1 September 2008). "Mission Possible". Air & Space Magazine. Smithsonian Institution. Retrieved 26 May 2009. 1 2 Zak, Anatoly (1 September 2008). "Mission Possible – A new probe to a Martian moon may win back respect for Russia's unmanned space program". AirSpaceMag.com. Retrieved 26 May 2009. ↑ "LIFE Experiment: Phobos". The Planetary Society. ↑ "Проект "Люлин-Фобос" – "Радиационно сондиране по трасето Земя-Марс в рамките на проекта "Фобос-грунт"". Международен проект по програмата за академичен обмен между ИКСИ-БАН и ИМПБ при АН на Русия – (2011–2015)". Bulgarian Academy of Sciences. ↑ "MetNet Mars Precursor Mission". Finnish Meteorological Institute. ↑ "Space technology – a forerunner in Finnish-Russian high-tech cooperation". Energy & Enviro Finland. 17 October 2007. ↑ "Fobos-Grunt probe launch is postponed to 2011" (in Russian). RIA Novosti. 21 September 2009. Retrieved 21 September 2009. ↑ "Russia delays Mars probe launch until 2011: report". Space Daily. 16 September 2009. ↑ Zak, Anatoly (April 2009). "Russia to Delay Martian Moon Mission". IEEE Spectrum. Retrieved 26 May 2009. ↑ "Industry Insiders Foresaw Delay of Russia's Phobos-Grunt". Space News. 5 October 2009. 1 2 "Difficult rebirth for Russian space science". BBC News. 29 June 2010. ↑ "Russia launches probe to Mars moon". RIA Novosti. 9 November 2011. 1 2 Mission profile Phobos-Soil project Archived 24 August 2014 at the Wayback Machine. ↑ "We need your support in the project "Phobos-Soil"". Russian Space Research Institute. 2011. Archived from the original on 24 August 2014. Retrieved 22 April 2012. ↑ "Phobos-Grunt to be launched to Mars on Nov 8". Interfax News. 4 October 2011. Retrieved 5 October 2011. ↑ "Fobos-Grunt space probe is moved to a refueling station" (in Russian). Roscosmos. 21 October 2011. Retrieved 21 October 2011. ↑ "Timeline for the Phobos Sample Return Mission (Phobos Grunt)". Planetary Society. 27 October 2010. Retrieved 28 October 2010. ↑ Роскосмос признал, что шансов реализовать миссию "Фобос-Грунт" практически не осталось (in Russian). ↑ Amos, Jonathan (23 November 2011). "Signal picked from Russia's stranded Mars probe". BBC News. 1 2 3 4 Clark, Stephen (23 November 2011). "It's alive! Russia's Phobos-Grunt probe phones home". Spaceflight Now. ↑ "ESA receives telemetry from Russian Mars probe". RIA Novosti. 24 November 2011. 1 2 "Russia's Mars probe starts making regular contact". MSN News. 23 November 2011. Retrieved 20 May 2012. 1 2 "Space agency postpones Phobos contact until Monday". RIA Novosti. 25 November 2011. Retrieved 20 May 2012. ↑ Leonard David (22 November 2011). "Time Running Out to Save Russian Mars Moon Probe". Retrieved 14 May 2012. ↑ Leonard David (6 December 2011). "Russia's Mars Probe Appears 'Dead in the Water'". Retrieved 12 May 2012. ↑ "Data beamed from Russia Mars probe 'deciphered'". RIA Novosti. 24 November 2011. Retrieved 20 May 2012. ↑ "Most Popular E-mail Newsletter". USA Today. 1 December 2011. ↑ Enoch, Nick (16 January 2012). "Maybe Brazil... or possibly off the coast of Chile? Russian officials admit having no idea where failed Mars probe has crashed". Daily Mail. London. Retrieved 16 January 2012. ↑ "Ballistics confirmed the coordinates of the fall of the "Phobos-Grunt" (Google Translate from Russian: Баллистики подтвердили координаты точки падения "Фобос-Грунта")". RIA Novosti. 16 January 2012. Retrieved 16 January 2012. ↑ Sanderson, Katharine (18 January 2012). "Phobos-Grunt Crashes Into the Pacific". Astrobiology Magazine. Retrieved 28 March 2012. ↑ Bloomberg (17 January 2011). "Oops! Radar may have caused space crash". Sidney Morning Herald. Retrieved 20 May 2012. ↑ Oberg, James (16 February 2012). 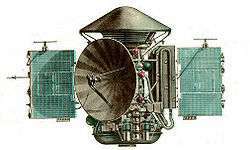 "Did Bad Memory Chips Down Russia's Mars Probe?". IEEE Spectrum. Retrieved 30 March 2012. ↑ Vergano, Dan (8 January 2012). "Underfunding doomed Russian Mars probe, lawyer says". USA TODAY. Retrieved 23 March 2012. ↑ de Carbonnel, Alissa (31 January 2012). "Russia blames Mars probe failure on space radiation". Reuters. Retrieved 27 February 2012. ↑ Clark, Stephen (6 February 2012). "Russia: Computer crash doomed Phobos-Grunt". Spaceflight Now. Retrieved 29 February 2012. ↑ "Programmers are to be blamed for the failure of Phobos mission". ITAR-TASS News Agency. 31 January 2012. Retrieved 29 February 2012. ↑ "Medvedev suggests prosecution for Russia space failure". Reuters. 26 November 2011. ↑ Olga, Zakutnyaya (2 February 2012). "Russia's Ambitious space projects: Phobos-Grunt-2?". Russian and India Report. Retrieved 1 April 2012. ↑ Russia to make another attempt to bring back Mars moon material. 16 October 2013. ↑ ""Phobos-Grunt-2" can be launched in 2020, says the head of IKI". RIA Novosti. 25 April 2012. Retrieved 29 April 2012. ↑ "Federal Space Agency accepted the offer to renew the RAS Project "Phobos-Grunt"" (in Russian). Interfax.ru. 10 April 2012. Retrieved 15 April 2012. ↑ "Russia May Run Repeat Mission to Phobos". RIA Novosti. 31 January 2012. Retrieved 11 February 2012. ↑ "Federal Space Agency is going to repeat the project "Phobos-Grunt"". RBC. 19 April 2012. Retrieved 20 April 2012. ↑ "Russia to focus on Moon, Mars exploration, repeat Phobos-Grunt mission". ITAR - TASS. Moscow. 2 August 2014. Retrieved 3 August 2014. ↑ "Russia May Send Repeat Mission to Martian Moon Phobos in 2023". RIA Novosti. Moscow. 3 October 2014. Retrieved 5 October 2014. 1 2 "ESA at MAKS 2015". European Space Agency. Zhukovsky, Russia: ESA. Retrieved 2015-12-22. ↑ Kane, Van (9 June 2014). "A Checkup on Future Mars Missions". The Planetary Society. Retrieved 2015-12-22. 1 2 Fobos-Grunt 2: "Choosing the launch window." 8 October 2015. Accessed on 29 December 2015. ↑ "Russia joins EU-led ExoMars expedition to Red Planet". Russia Today. 14 March 2013. Retrieved 14 March 2013. ↑ Korablev, O. "Russian programme for deep space exploration" (PDF). Space Research Institute (IKI). p. 14. ↑ "Living Interplanetary Flight Experiment (LIFE)". The Planetary Society. ↑ "Optico-electronic Instruments for the Phobos-Grunt Mission". Space Research Institute of the Russian Academy of Sciences. Retrieved 20 July 2009. 1 2 3 4 5 6 7 8 Harvey, Brian (2007). "Resurgent – the new projects". The Rebirth of the Russian Space Program (1st ed.). Germany: Springer. ISBN 978-0-387-71354-0. ↑ "Optical Solar Sensor". Space Research Institute of the Russian Academy of Sciences. Retrieved 20 July 2009. 1 2 3 4 "Russia resumes missions to outer space: what is after Phobos?" (in Russian). 1 2 "COSPAR Planetary Protection Policy". ↑ "Phobos Flyby Images: Proposed Landing Sites for the Forthcoming Phobos-Grunt Mission". Science Daily. 15 March 2010. Archived from the original on 7 November 2011. Retrieved 7 November 2011. 1 2 3 4 Zak. "Mission Possible". ↑ "Russia's Phobos Grunt to head for Mars on November 9". Itar Tass. 25 October 2011. Retrieved 27 October 2011. ↑ DiGregorio, Barry E. (28 December 2010). "Don't send bugs to Mars". New Scientist. Retrieved 8 January 2011. ↑ McLean, R; Welsh, A; Casasanto, V (2006). "Microbial survival in space shuttle crash". Icarus. 181 (1): 323–325. Bibcode:2006Icar..181..323M. doi:10.1016/j.icarus.2005.12.002. PMC 3144675 . PMID 21804644. Galimov, E. M. (2010). "Phobos sample return mission: Scientific substantiation". Solar System Research. 44: 5. Bibcode:2010SoSyR..44....5G. doi:10.1134/S0038094610010028. Zelenyi, L. M.; Zakharov, A. V. (2010). "Phobos-Grunt project: Devices for scientific studies". Solar System Research. 44 (5): 359. Bibcode:2010SoSyR..44..359Z. doi:10.1134/S0038094610050011. Rodionov, D. S.; Klingelhoefer, G.; Evlanov, E. N.; Blumers, M.; Bernhardt, B.; Gironés, J.; Maul, J.; Fleischer, I.; et al. (2010). "The miniaturized Möessbauer spectrometer MIMOS II for the Phobos-Grunt mission". Solar System Research. 44 (5): 362. Bibcode:2010SoSyR..44..362R. doi:10.1134/S0038094610050023. Wikimedia Commons has media related to Phobos-Grunt mission. † indicates failure en route or before intended mission data returned. Payloads are separated by bullets ( · ), launches by pipes ( | ). Manned flights are indicated in bold text. Uncatalogued launch failures are listed in italics. Payloads deployed from other spacecraft are denoted in (brackets).